The Lenovo ThinkSystem SR550 dual-socket 2U rack server is ideal for small to large organizations that need performance, storage capacity, flexible I/O, and resiliency. With industry-leading reliability† and customer satisfaction‡, and designed to handle a wide range of workloads, SR550 cost-effectively performs complex analytics on structured and unstructured data, speeds transactional systems, and powers through collaboration workloads with ever-growing data sets and large files shared within an organization. SR550 offers numerous features to increase performance and flexibility. It features two second-generation Intel® Xeon® Processor Scalable family CPUs, with 43% more cores, faster 2933MHz memory,* increased I/O, and more storage capacity than the previous generation. Software and hardware RAID with simple-swap hard drives make it easy to manage storage needs. SR550 also supports two internal M.2 boot drives, freeing up the other drive bays for additional storage capacity. Front USB 3.0 ports and optional front VGA simplify deployment and servicing. Plus, up to six PCIe adapter slots and several choices of optional 1GbE/10GbE LOM and NICs, 80 PLUS Platinum and Titanium PSUs, and continuous operation at 45°C, provide additional flexibility and cost savings. Lenovo XClarity Controller is a hardware embedded management engine common in every ThinkSystem server. XClarity Controller features an uncluttered graphical user interface, industry standard Redfish-compliant REST APIs, and enables booting in half the time of prior generation servers, with up to 6x faster firmware updates. Lenovo ThinkShield is a comprehensive end-to-end approach to security that begins with development and continues through supply chain and the full life cycle of the device. From the data center to the edge of the network our priority is protecting your business with each product. OSes Supported Microsoft, SUSE, Red Hat, VMware. Visit lenovopress.com/osig for more information. 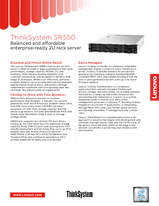 To learn more about the Lenovo ThinkSystem SR550, contact your Lenovo representative or Business Partner or visit: www.lenovo.com/thinksystem. For detailed specifications, consult the SR550 Product Guide. † ITIC 2018 Global Reliability Report. ‡ TBR x86-based Servers Report 2018. * Based on Intel internal testing, August 2018. Trademarks: Lenovo, the Lenovo logo, Lenovo XClarity, ThinkAgile, ThinkSystem, and TruDDR4 are trademarks or registered trademarks of Lenovo. Intel® and Xeon® are trademarks or registered trademarks of Intel Corporation or its subsidiaries in the United States and other countries. Microsoft® is a trademark of Microsoft Corporation in the United States, other countries, or both. Other company, product, or service names may be trademarks or service marks of others. Document number DS0030, published February 14, 2018. For the latest version, go to lenovopress.com/ds0030.